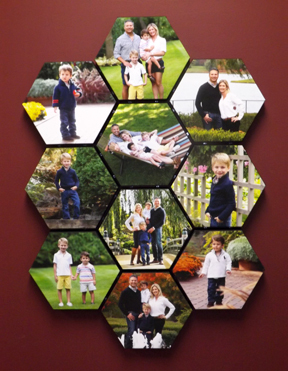 Create unique hexagonal canvas wraps with the new Hex Wrap kits from ink2image. Assembled in a matter of minutes without specialist stretching or stapling equipment, Hex Wraps can be hung individually or in groups of up to ten using Hex Wrap collage clips. Setting up and printing your images is a breeze using our free Photoshop template download. A finished Hex Wrap measures 10” from corner to corner and 8 ¾” from side to side, and is 1 1/4" deep. Hex Wrap collage clips allows up to ten Hex Wraps to be joined in a variety of patterns and designs. If you want to wrap your image around the sides of the Hex Wrap bars then simply size and print your image 12.75” wide and 11.4" high. However, for images that are cropped so closely that the subject matter would wrap over the edges of the Hex Wrap we provide a simple to use Photoshop template that crops your image to a hexagonal shape and allows for a plain color to be printed on the sides of the Hex Wrap. The Photoshop template along with usage instructions can be downloaded from our support page at Ink2image by clicking here. To order Hex Wrap, first you will need a Hex Wrap starter kit. This includes the six reusable corner guides, 30 Hex Wrap stretcher bars to make five complete wraps, and 8 collage clips to enable the five wraps to be joined together. Once you have the reusable corner guides, Hex Wrap stretcher bars can be ordered in pack of 36 and collage clips can be ordered in packs of 40. Our range of high quality inkjet canvas works perfectly with the Hex Wrap system. Click here to go to the Fine Art media category where our canvas is listed at the bottom of the page. It is also wise to protect inkjet canvas prints from scratches and airborne contaminants by using a top coating. Our Print Guard range of protective lacquers can be seen by clicking here. Anyone with a 13” or wider printer can use the Hex Wrap kits. For home users and hobbyists, they are an ideal way of presenting your images, and a perfect gift for family and friends. For professional printing companies, they represent a great opportunity for a high value added resale – photo printing businesses can offer them as unique photo presentation to any customer. For wedding and event photographers, they are a simple and quick way of generating extra revenue from their images.